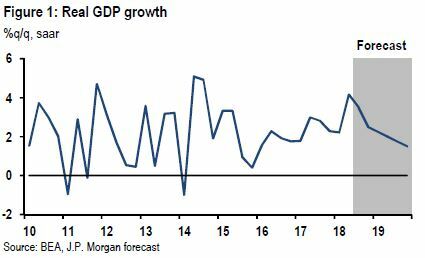 JP Morgan economists said the economy should grow at a slower pace of 1.9 percent from the fourth quarter’s year over year rate of 3.1 percent. They point to reduced stimulus from fiscal and monetary policy and negative drag from trade policy. The economist expect the Fed to raise interest rates four times, and consumer inflation running at a pace of 2.3 percent. The U.S. consumer benefited in 2018 from a tax cut amounting to roughly $120 billion, they noted.